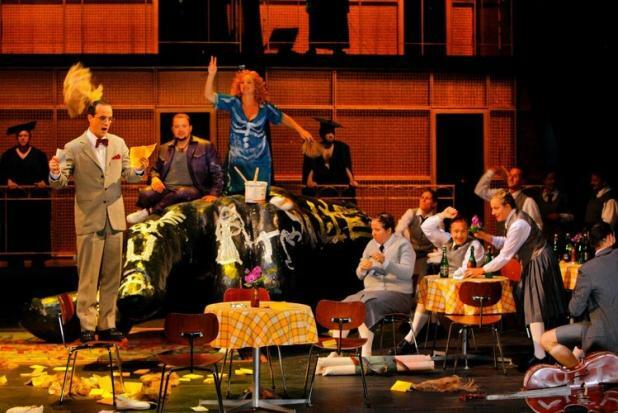 Katharina Wagner’s Bayreuth production of Die Meistersinger is widely loathed (and the director was indeed greeted by a torrent of boos at the end). A few people covertly whispered to me, “I actually kind of like it,” as if they were confessing on the sacred ground of the Green Hill that they prefer Verdi to Wagner. As a matter of general principle I would have loved to join this secret circle of Katharina admirers, but in the end I was unconvinced (though not loathing). Which is too bad, because there’s some genuinely interesting stuff in this thing. The only problem is that it’s a mess, and unfortunately not an entertaining one. More disappointing was the low musical quality of this performance. Wagner, Die Meistersinger von Nürnberg. Wagner-Festspiele Bayreuth, 7/26/2011. 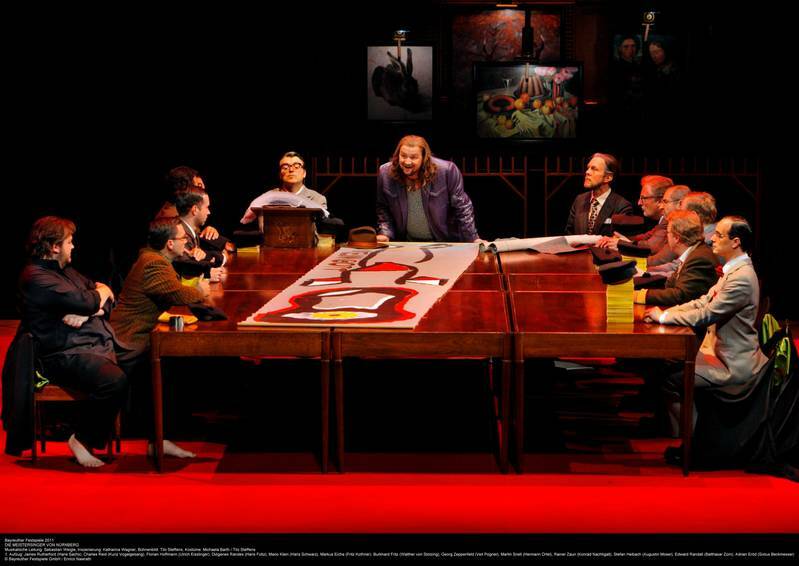 Production by Katharina Wagner, conducted by Sebastian Weigle with James Rutherford (Hans Sachs), Burkhard Fritz (Walther von Stolzing), Michaela Kaune (Eva), Adrian Eröd (Beckmesser), Norbert Ernst (David), Georg Zeppenfeld (Veit Pogner). This production is already available on DVD, but it has undergone some changes in recent years. You can see a bit of the DVD at the end of this post. The setup is clear enough. The masters are part of a museum-like space or academy dedicated to the worship of dead art, with the uniformed apprentices as their students. Their art is not just singing but, in vaguely-Gesamtkunstwerk-ish fashion, a little bit of all the arts. Scattered around the set are a cello, a piano, some Dürer and other paintings, and an enormous number of Reclam books (little yellow paperback editions of classic German literature). The worship is even takes the form of religion, with a communion-like ceremony around one of the Reclams. Among this reactionary, mindless, and rule-bound worship of the past (David spends his rules lesson photocopying Reclams, and the apprentices take a good 10 minutes to assemble a big table in faultlessly ordered fashion), Walther is an action painter or graffiti artist who splashes paint on whatever is nearby, preferably some icon of past culture like a piano or a cello. The use of visual art as a realization of the various singer characters’ performances is a theme of the entire production, and ultimately for me its biggest sticking point. In Act 1, it’s clear enough: Given a giant jigsaw puzzle of Nuremberg, Beckmesser assembles it “correctly” and Walther makes an Escher-like crazy landscape. This production wants to be a drama of ideas. Unfortunately, the first two acts have such a narrow concept that it turns obvious and repetitious. The stage is usually in motion, but without character development. You can only watch people dump paint on things for so long before you lose interest. This seems a shame for Meistersinger, which more than any other Wagner work is populated by accessible human characters. Katharina (sorry, her last name obliges us to be on first-name terms) doesn’t seem to be interested in that, and there’s not enough else going on. The Act 3 staging is the stage direction equivalent of the Act 2 riot, and the content gets a lot more diverse and interesting. But suddenly there’s so much happening that it’s hard to keep up. Hans Sachs turns out to not be such a liberal after all, and tutors Walther in the painting of a realistic image of trees, later elaborated in the final scene’s Preislied into a tableau vivant stage set of old-school Wagnerian medieval kitsch. Walther’s supposed aesthetic realignment is one of bourgeois conformity, as in the quintet when he and Eva, David and Magdalene form picture-perfect nuclear families. He exchanges his purple pants, and Sachs his casual outfit, for fancy business suits. As we move into the meadow, a bunch of icons of German thinkers in their underwear with oversized masks tie Sachs to a chair and perform a weird dance. This went right over my head. 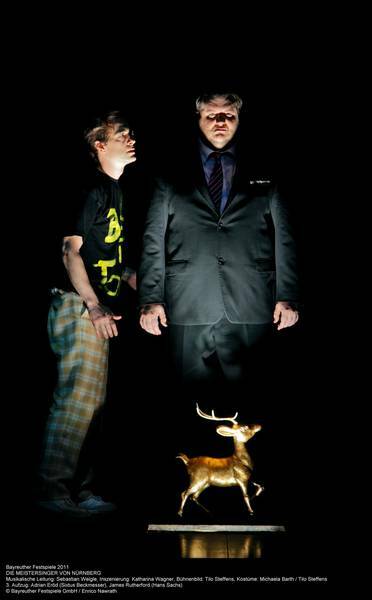 Somewhat clarifying was the subsequent appearance of a conductor, stage director, and designer, who bow and are then stuffed in a dumpster and melted down to form a golden stag (calf?) of some sort. Creativity has been demolished in favor of a new conservatism. In turn with Walther’s transformation, Beckmesser becomes like the Walther of Acts 1 and 2, performing a weird performance art piece at the trial involving a sand sculpture and some naked people. The crowd, an identically-dressed group who could be Bayreuther Festspiele-goers, prefers Walther’s Mastersinger-like vision over Beckmesser’s incomprehensible avant-garde, and he is awarded a the golden calf, plus a giant check from the Nürnberger Bank like he just won a reality TV show. As Sachs warns about the threatened sacred German art, the stage dims to make him a sinister, solitary figure. The tyranny of the reactionary masses has triumphed again. Katharina seems to owe something to Adorno. She suggests that Wagner’s argument in favor of revolutionary art is a mixed message, cloaked as it is in a decidedly non-revolutionary form, and reminds us that its subsequent legacy (particularly at Bayreuth) has been not an endorsement of artistic freedom but of arch-conservatism. This is interesting, and it’s a shame that the show itself is often so inept, poorly paced and blocked that it isn’t transmitted more clearly and engagingly. I also think the interpretation works much more closely with the words than the music. It sets up the metaphor of mastersinging to visual arts, but then stages a transformation in both Walther’s and Beckmesser’s styles of painting that is not reflected in their music. Walther’s style changes between Act 1 and Act 3, but only in a matter of degree, not the radical shift of his painting aesthetic from splashing to realistic landscape. And Beckmesser’s Act 2 and Act 3 music is stylistically consistent, but his painting is not. This seems like a case of wanting to have one’s Regie cake and eat it too. She also did not have the benefit of a good cast. The first problem was Sebastian Weigle’s soggy conducting. Granted, the Festspielhaus does not present an ideal acoustic for Meistersinger, but only he can be blamed for the weirdly quiet brass, leaden tempos (losing Sachs at several points during the Hammering Song, because he could not sing slowly enough), and complete lack of grandeur. The orchestral playing was mostly OK, though the woodwinds went out of tune a few times. The singing was rather below A-list level and, despite enthusiasm, genuine charisma was in short supply. 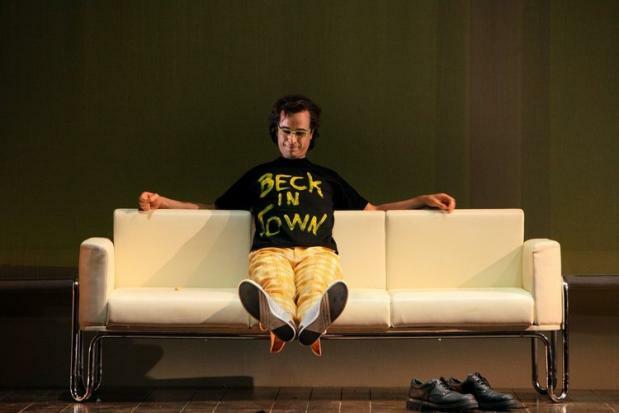 According to some regulars, last year’s Klaus Florian Vogt lent a degree of charm to this bratty interpretation of Walther, but I can say that this year’s tenor, Burkhard Fritz, most certainly did not. While he was rarely inaudible and never really made ugly sounds (more than can be said of many Wagner tenors), his completely underpowered, seemingly lyric tenor was colorless and lacking in thrust and ardor. Resembling, tragically, recent Mickey Rourke, he was more an aging B-list rocker than a revolutionary. James Rutherford was a very youthful Sachs, and his cavernous but unfocused voice carried little gravitas. Michaela Kaune made an acceptable Eva, though sounded a bit overripe. 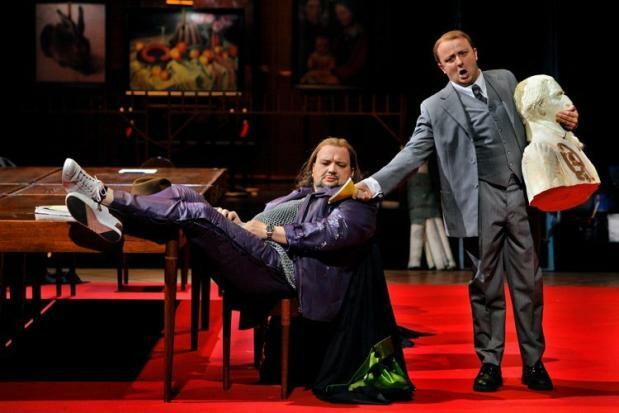 Highlights were surprisingly two Wiener Staatsoper regulars: Adrian Eröd’s accurate and funny Beckmesser and, most of all, Norbert Ernst’s brightly sung David, who overpowered Fritz at times. With all due respect to Ernst, when David is your vocal highlight, that’s a Meistersinger with some problems. The other smaller roles were finely sung and well rehearsed. My first Bayreuth performance was still a memorable experience, due to it being Bayreuth, but luckily I returned later in the week for what turned out to be an infinitely better experience. More on that shortly.